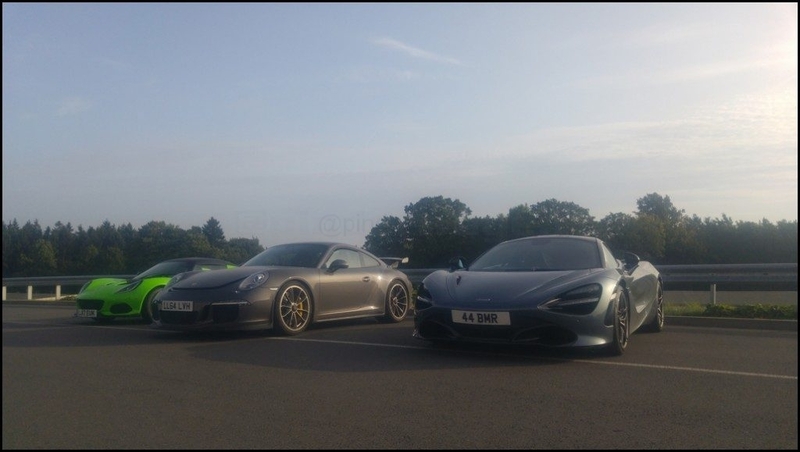 911uk.com - Porsche Forum : View topic - My report from an incredible trackday at BilsterBerg ! 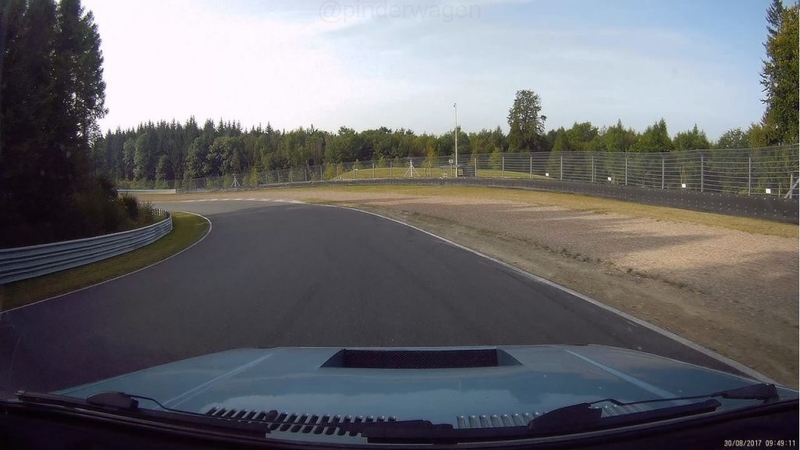 911uk.com Forum Index > Trackdays, Road Trips & Drives > My report from an incredible trackday at BilsterBerg ! 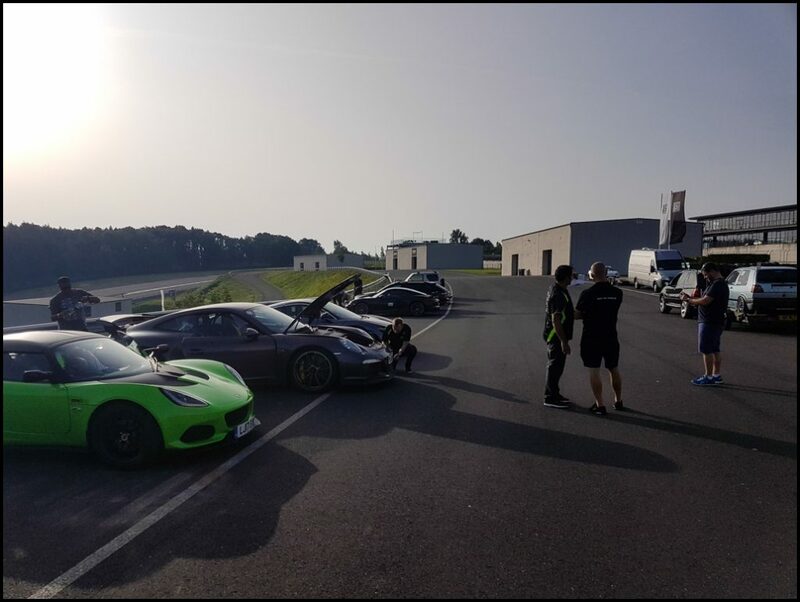 Posted: Sat Nov 18, 2017 7:14 am Post subject: My report from an incredible trackday at BilsterBerg ! 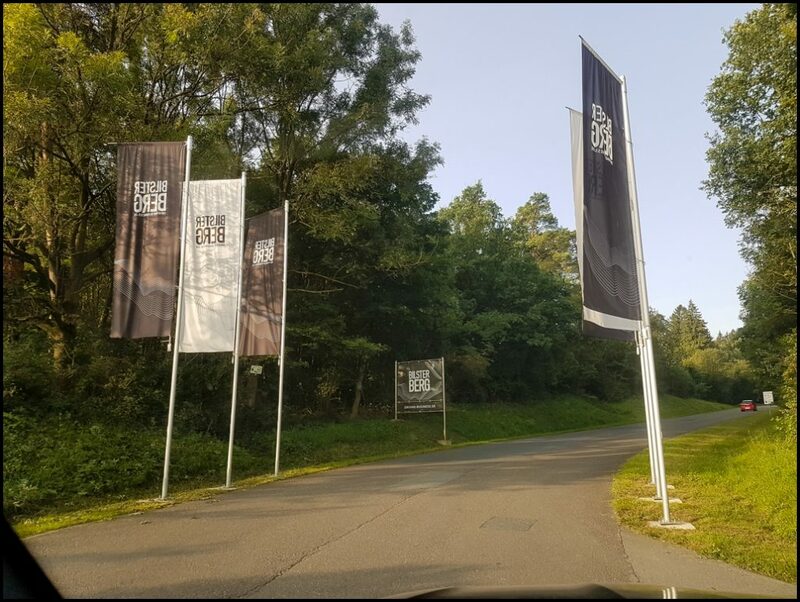 When the event details were released I was unsure if I was going to bother doing BilsterBerg. 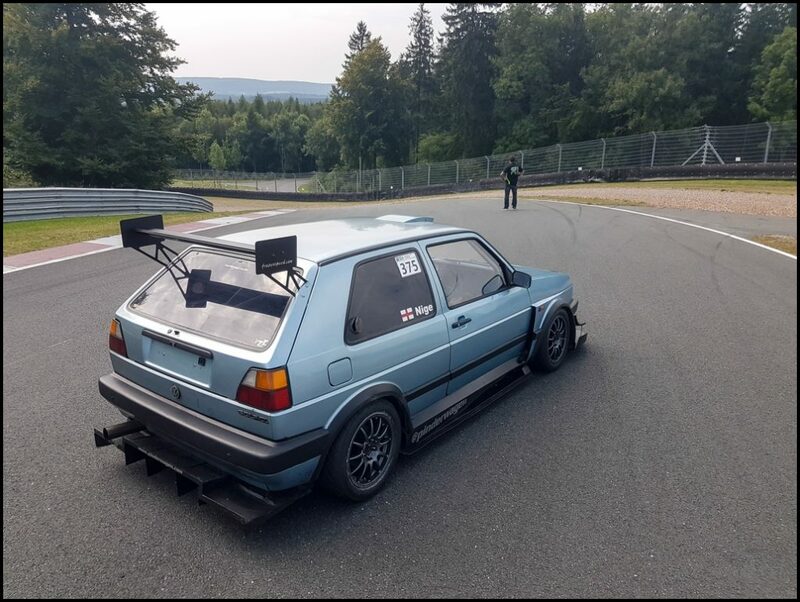 It was a circuit I was aware of but hadn`t really read much about it and after 2 days on the Ring, did I really need to do another day and if so, would the Golf still be running ? 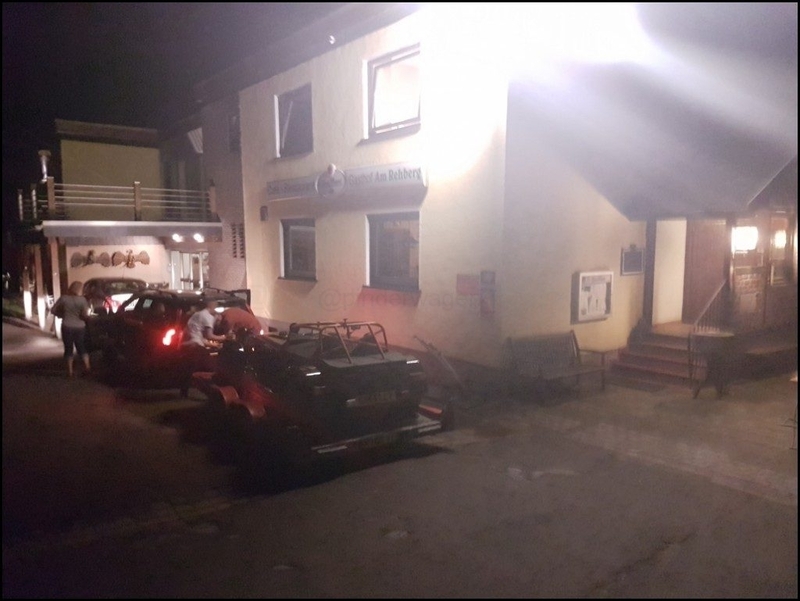 Rather than sitting down for a nice meal to discuss the previous few days driving with mates over a drink or 2, we had a quick shower and by 18:30 we were on our way. 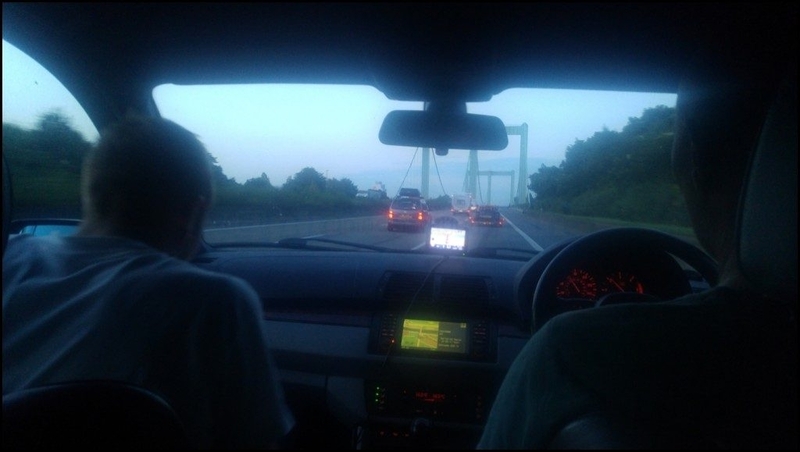 The SatNav sent us up the A1 towards Cologne. However, when we arrived at the crossing over the Rhine, it was closed to trailers and heavy vehicles. Thinking nothing of it we simply followed the detour and put our faith in good old German efficiency. We couldn`t see any easy way around, so I pulled up at the side of some road-workers and in my broken German asked them how we could get across the river. With much gesticulating and browsing of google maps, they showed me the route. Which took us 45 minutes back in the wrong direction before cutting across to the East. We were not happy. At all. Steve & Helen were driving in convoy with us and whilst Matt was trying to find a way around we followed Steve for a while. We spoke on the phone but eventually realised we had to go the long way around. 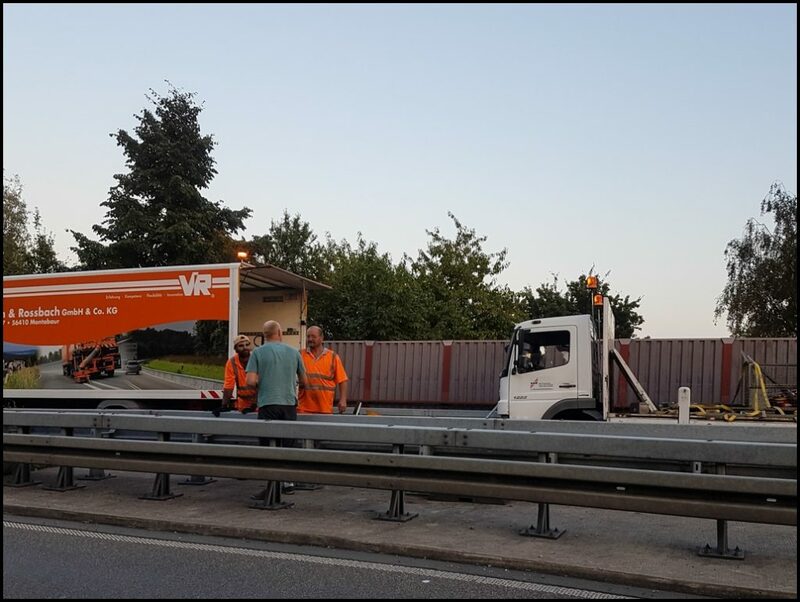 The SatNav hadn`t picked up the issue as the road was still open to normal traffic, just not to trailers or heavier vehicles. Our plan was to drive until we were past half way and then stop for a meal before finishing the journey and arriving at the guesthouse around 22:00. At 22:00 we were still driving and by 22:30 we made the decision to stop at a McDonalds for a burger. Helen does NOT do McDonalds , we needed food so she had a wrap whilst we sat and discussed the journey and the fact we should have been sat having a beer by now after a steady drive. 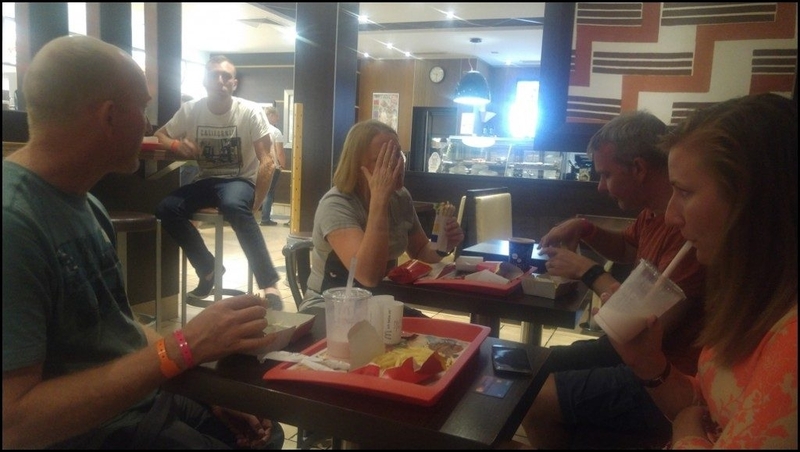 "Do NOT take a photo of me eating in McDonalds...."
It was late by the time we parked up and everyone else had arrived at their hotel some time ago. 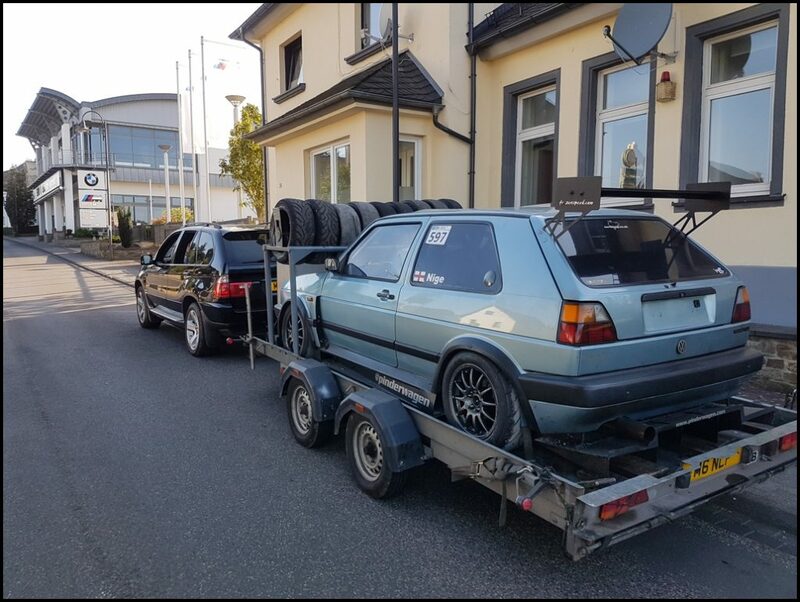 I actually hadn`t felt too tired whilst towing as we had all been discussing the trackday we`d just had and the journey actually passed surprisingly quickly. Saying that, as soon as we checked in I went straight to bed and was asleep in moments. I didn`t wake up at all and the alarm woke me at 07:00 and I felt brilliant after such a long sleep. 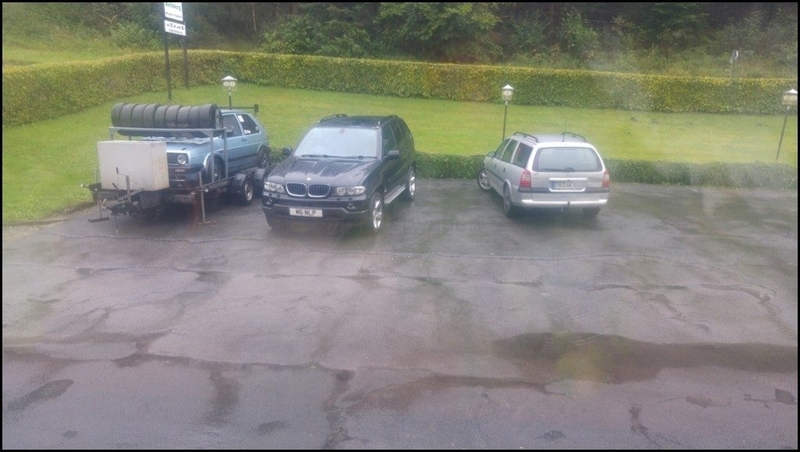 Had breakfast at the guesthouse and made the short drive to BilsterBerg. It`s a new dedicated complex and was only finished in 2013, the guard was expecting us and waved us through. 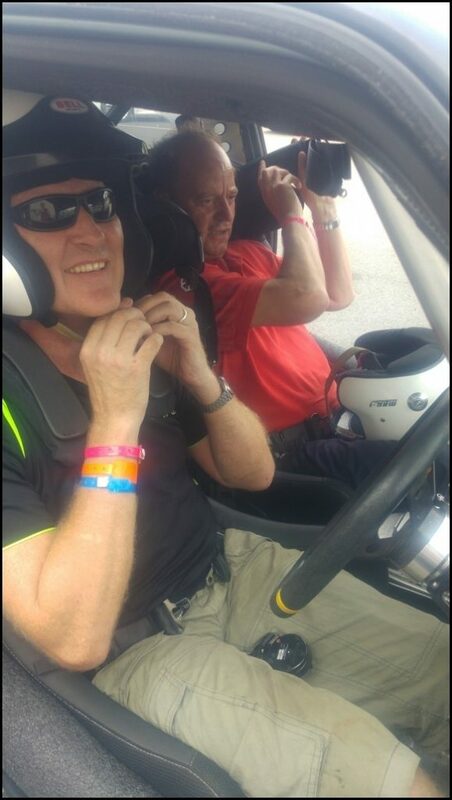 I was feeling apprehensive yet again but this time it wasn't worrying about the Golf, just me wondering what it would be like to drive a new circuit again as it was a long time since I'd done that. The pit garage was prepared for signing on and it turned out most of the drivers had been at the Nürburgring with us. We stood around discussing the previous 2 days and how much we were all looking forward to BilsterBerg. 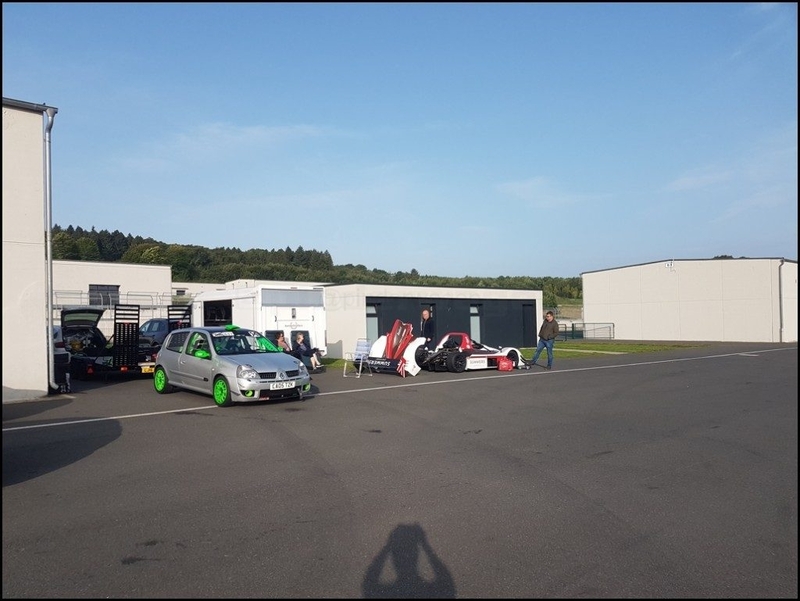 3 very capable cars, hardly a cloud in the sky, a new circuit to learn and a lot of excited drivers all looking forward to the day. 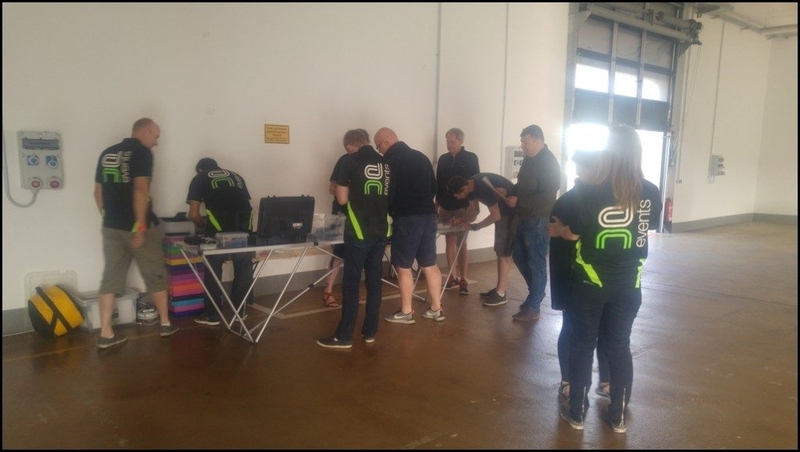 The circuit gave Darren a specific list of things he had to explain in the briefing and that included every car being fitted with a transponder in a certain way. They even gave him a laminated instruction sheet showing how they should be attached. 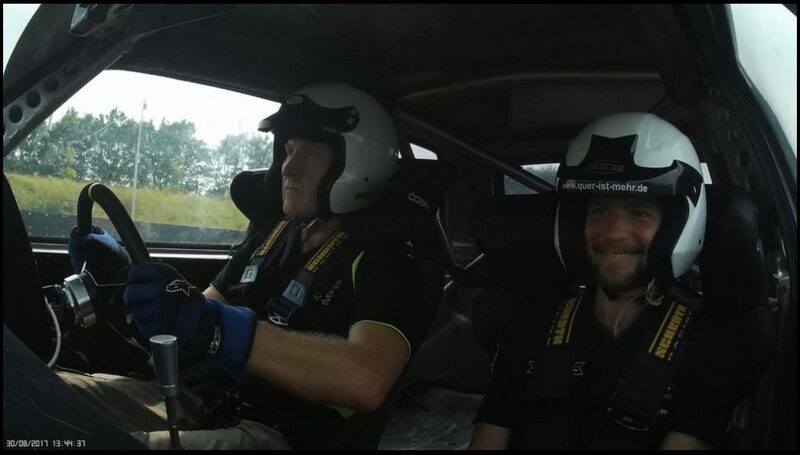 I wasn`t sure if Ben in the Clio or Lee in the Radical would have the most fun here. It looks a small technical circuit and we were all thinking the nimble cars could be better suited. 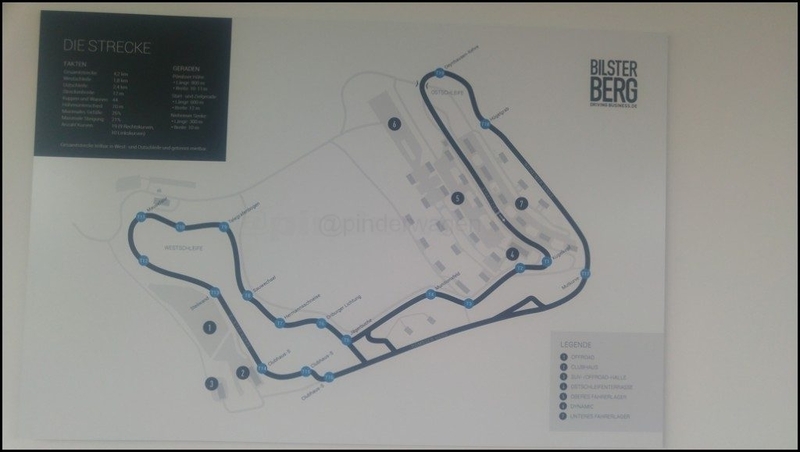 As with most circuit maps, they don`t show the circuit elevation changes. 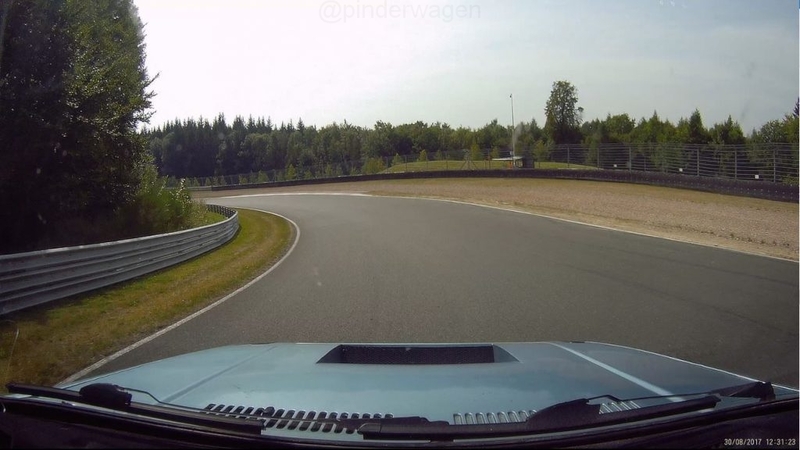 From what I had been told, there were some very steep sections at BilsterBerg. I went out with the first group for the sighting laps which were at a very pedestrian pace. It gave me opportunity to have a good look around and take note of the marshall post locations. Oh wow ! It has so many blind corners and crests I didn`t have a bloody clue where I was going from one corner to the next ! After the sighting laps it was open Pitlane. 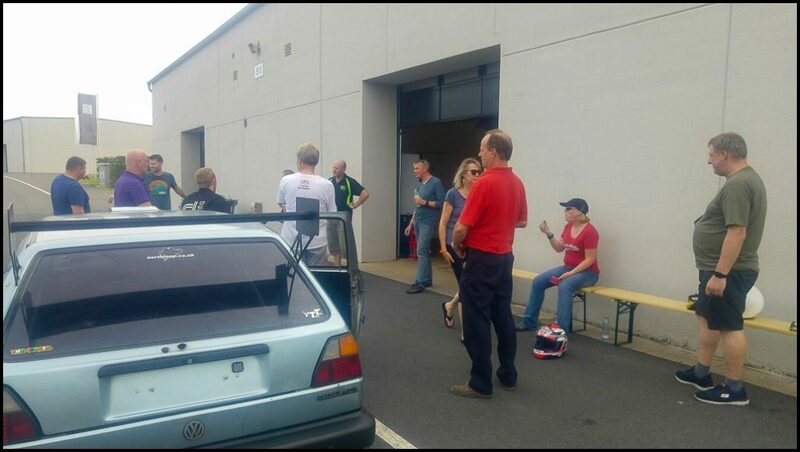 Matt sat in the Golf and just before we left the pits asked if I had learned the circuit before hand. "Nope, I want to learn it today whilst driving. I don`t get to visit new circuits that often so thought I would see how it went." He had watched loads of incar footage and had a much better idea of where it was going than I did. Lap 1, we entered the Mausfalle and almost understeered off the circuit. If you compare the 2 screengrabs below, you will see I am much closer to the right of the circuit on the first lap when I should actually be close to the left hand side ! We both started laughing at how close I had been to going off on the first lap. The line I should have taken. This was from a session just before lunch when I had started to learn the layout..
We did half a dozen laps then came back in to the pits to lower the tyre pressures and discuss the circuit. The only thing every driver was talking about was how they almost ran off the circuit on the first lap when dropping into the Mausefalle. 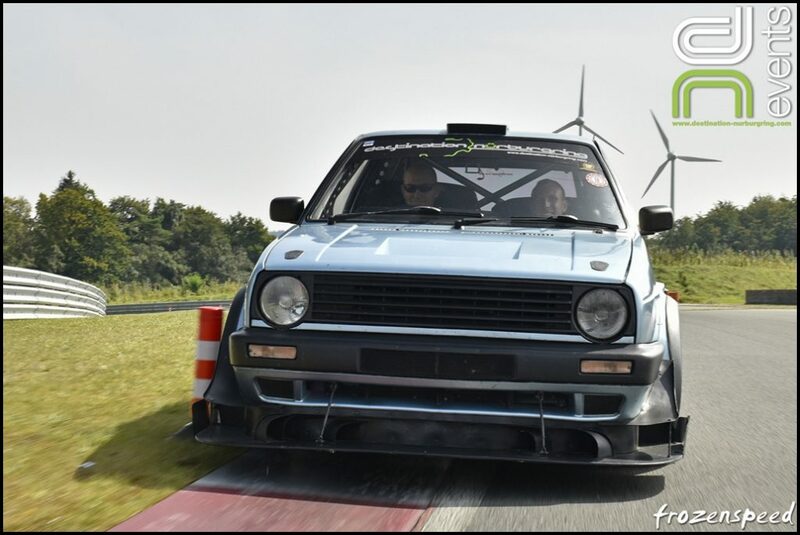 It is such a misleading corner and you carry speed into it, then it tightens just when you don`t want it to. There was lots of arm twirling and gestures showing understeer in the compression. Even if you couldn`t hear what was being said, there was no doubt about it from the body language. 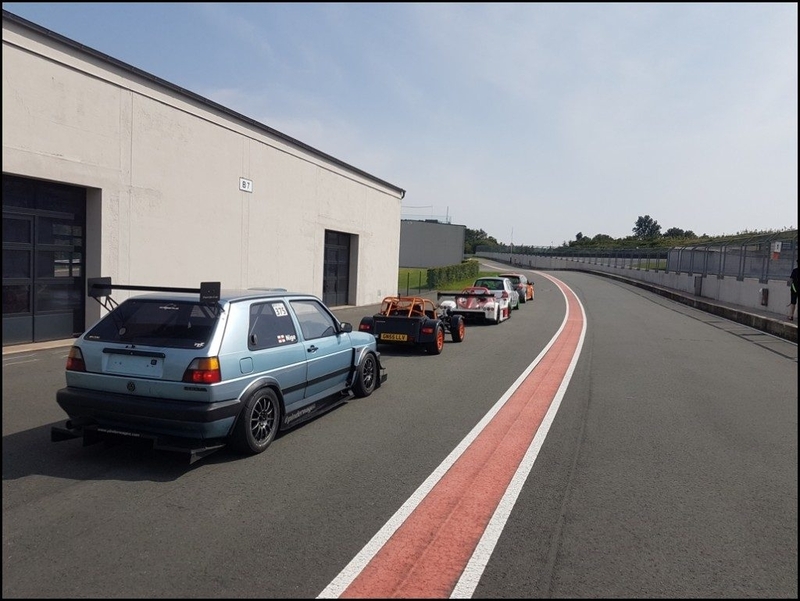 Usually, when I organise a trackday in UK I do it on a forum where I am a moderator. 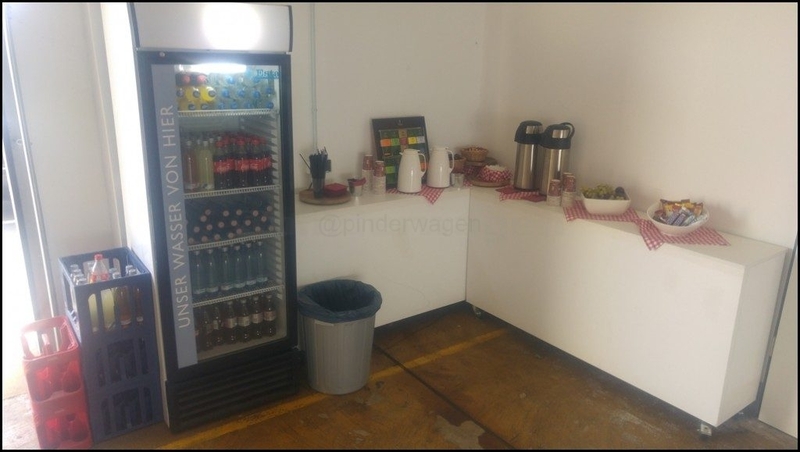 We try and get a few garages close to each other and bring coffee, biscuits and set it up in the corner where it is free for anyone from our group. This always works well as a focal point to meet up and talk. 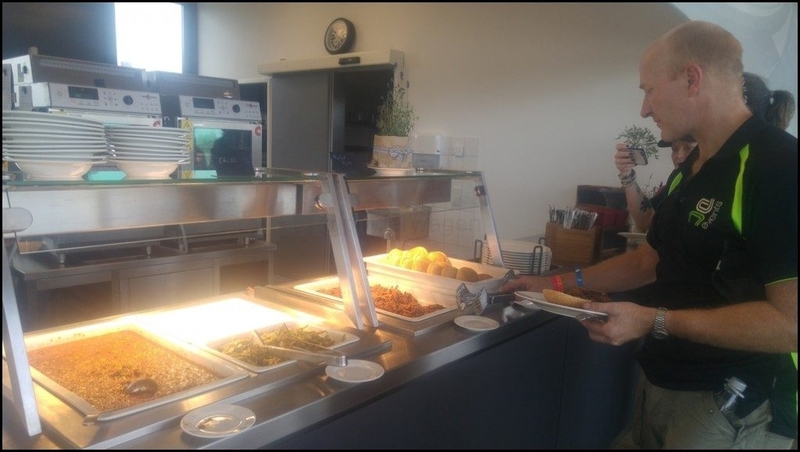 What we don`t have is a cold fridge stocked with fruit juices, soft drinks with hot Tea and coffee, chocolate, fruit which is regularly stocked throughout the day. This was all included in the event and boy was it appreciated ! Climbing out of car, sweating and then helping yourself to an ice cold drink was heaven. I went out with Cat for another session and struggled. Boy did I struggle. I wasn`t going too fast but I was really finding it hard to get a line through the sequences of corners. I thought I would be frustrated but I was absolutely loving it although at the time I didn't know quite why. I was slowly getting there but even when I knew where the circuit went, I was still finding getting the right line tricky which is unusual. I don`t usually take this long to get upto a reasonable pace before I start fine tuning, but today I was taking ages to get up to speed. Fortunately, so was just about everyone else so it didn`t matter at all. 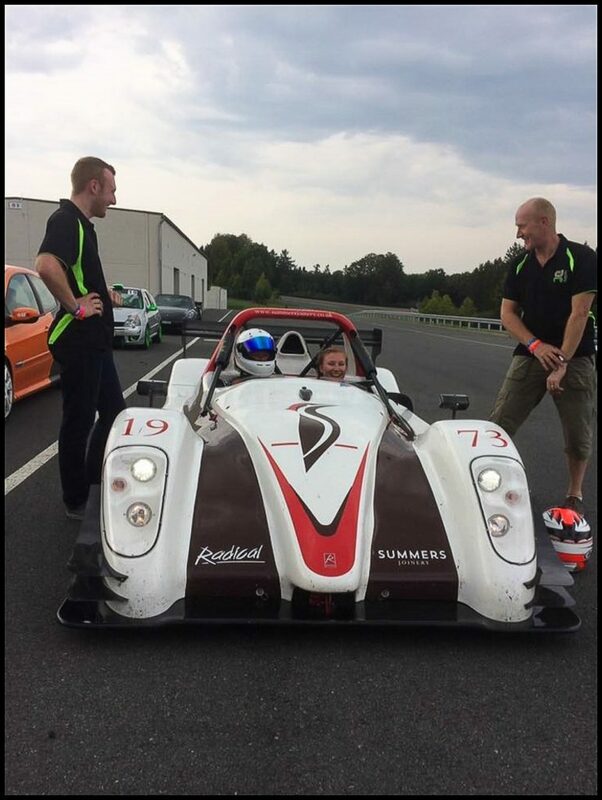 Then Lee asked Matt if he fancied going out in the Radical for a few laps. Matt has spoken to Lee at many DN events and knows him quite well. Matt immediately said yes and started getting in. 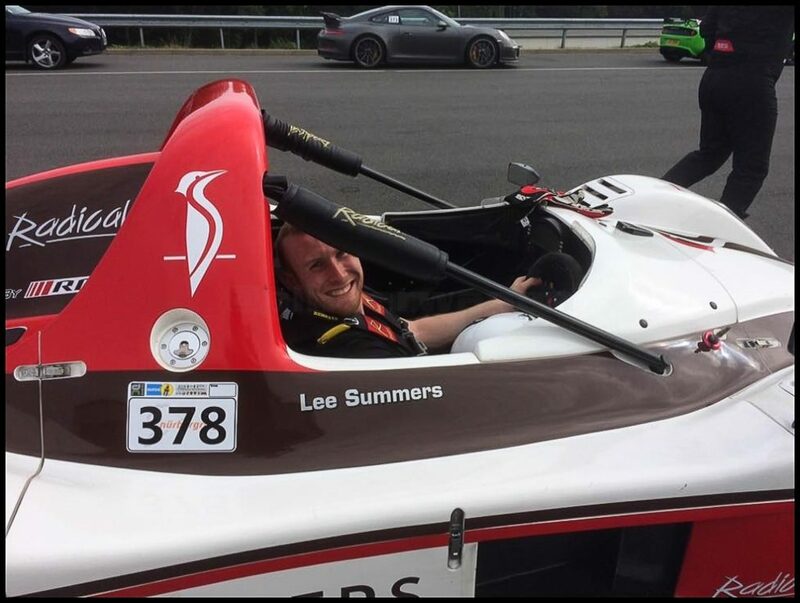 "Matt, I meant in the drivers seat...."
Even though I said it on the day, I still can`t thank Lee enough for this . Matt was absolutely buzzing for the rest of the trip after those laps and kept remembering different parts of the experience. He was actually surprised how `easy` it was to drive. Obviously not at the ultimate pace it can go but he was going at a reasonable rate and felt the car was so enjoyable to drive he wanted to do it again. The brakes were non-servo which was a first for him and he knew he wasn`t braking hard enough. 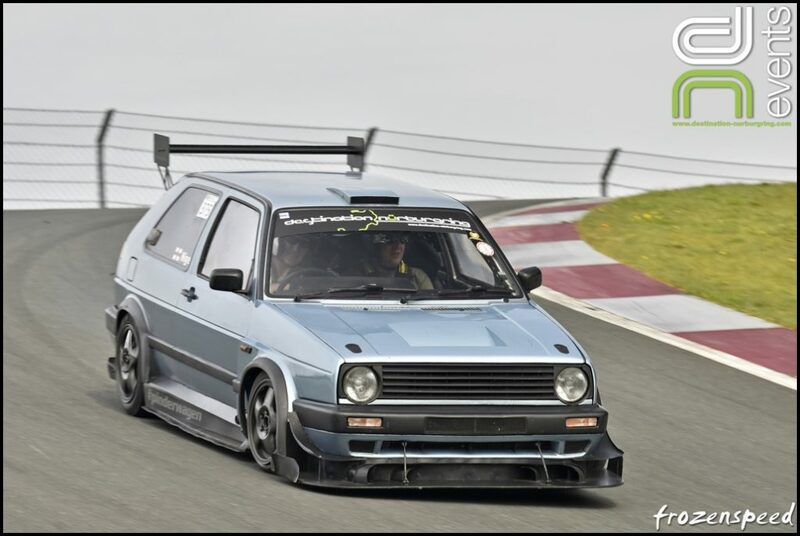 The mechanical and aero grip combined with RWD meant that tricky corners in the Golf where you have to compromise a corner to be stable for the next one wasn't an issue. Matt was sat slightly too low in the car which meant he had to drive the mousetrap by the distance from the outside as he couldn't see the apex. Apart from setting off the clutch isn't required so Matt could left foot brake. 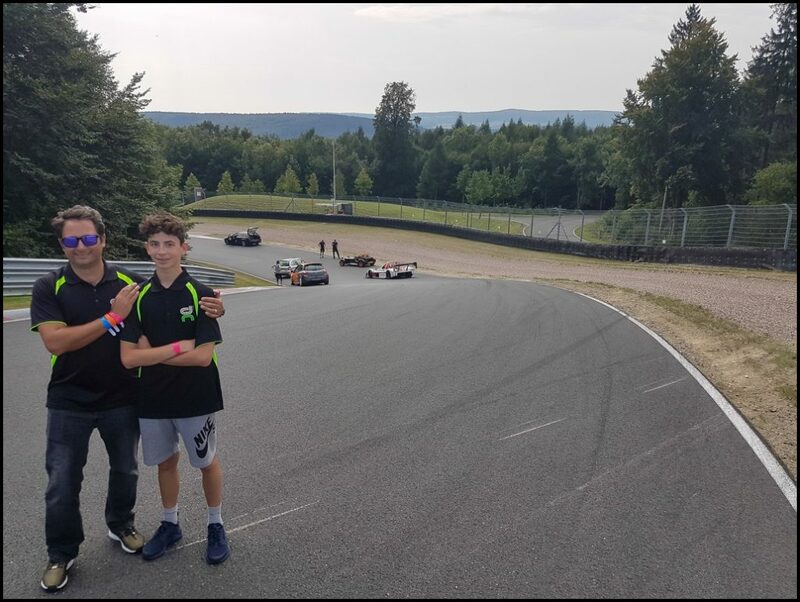 The fact it was a pedal box with no servo meant the pedal always required the same pressure and as he`s fairly proficient at left foot braking he was very comfortable with braking hard and deep into the corners after a couple of laps. 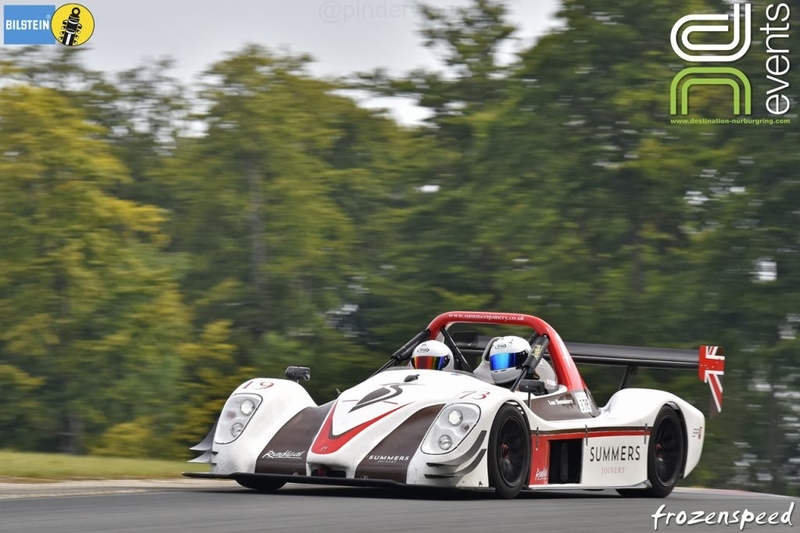 He found the car was extremely communicative and although he never pushed to anywhere near the limit, the aero could be felt around the fast left and the car felt a step up from the Golf in terms of high speed stability. Interestingly, it was neck and neck with the Golf in a straight line even when Lee was driving. 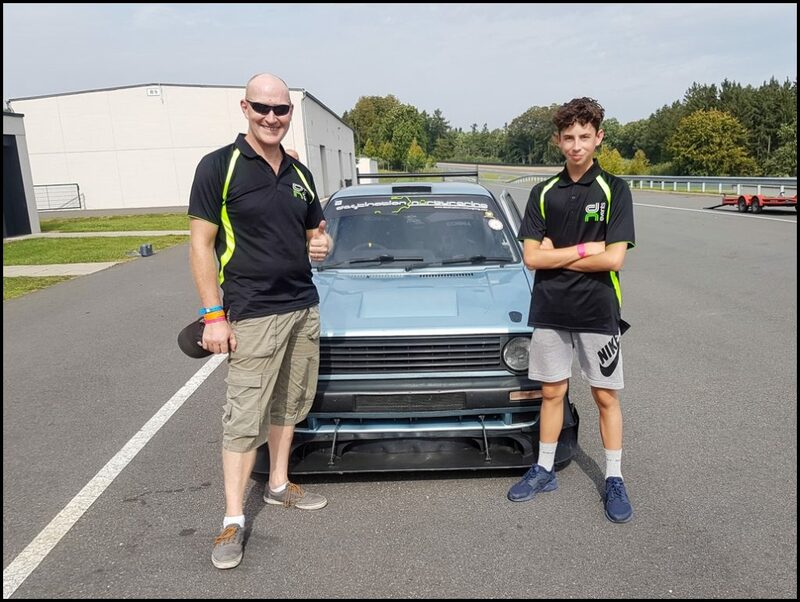 Toby has been to several trackdays but has always been too young to be allowed on track. He`s recently turned 16 so I took him out for a session. He was particularly impressed with the High Boost setting, commenting that it "felt fast anyway then felt really fast on high boost"
By now I was starting to press on. 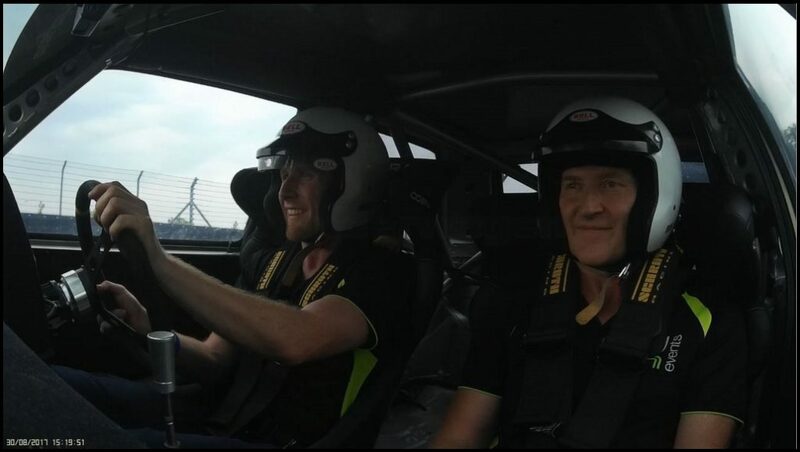 Moritz Gusenbauer was there instructing and I arranged to take him our for a few laps. Just before lunch he was free and asked if I wanted to take him out. 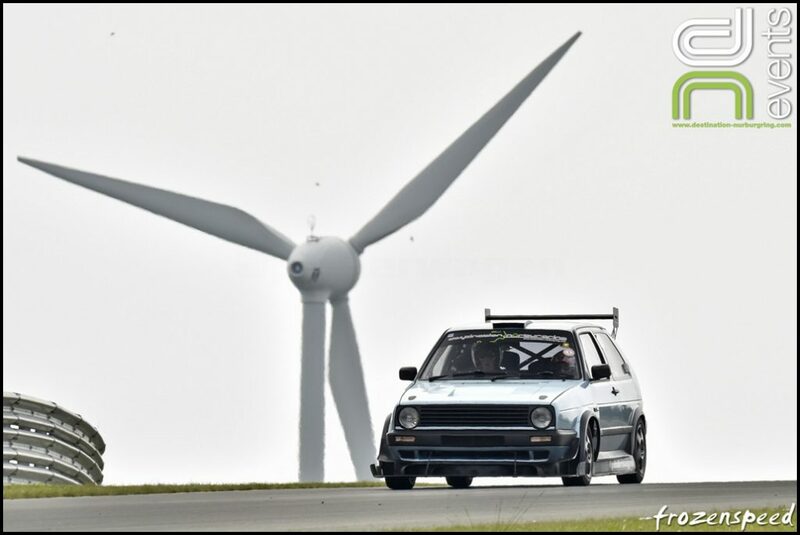 "I just want to try a different line and speed into the last chicane and I`d rather do it with my daughter in the car than you.. "
The majority of the energy use at the venue is from the Wind Turbines, but I wasn't looking at those when driving. 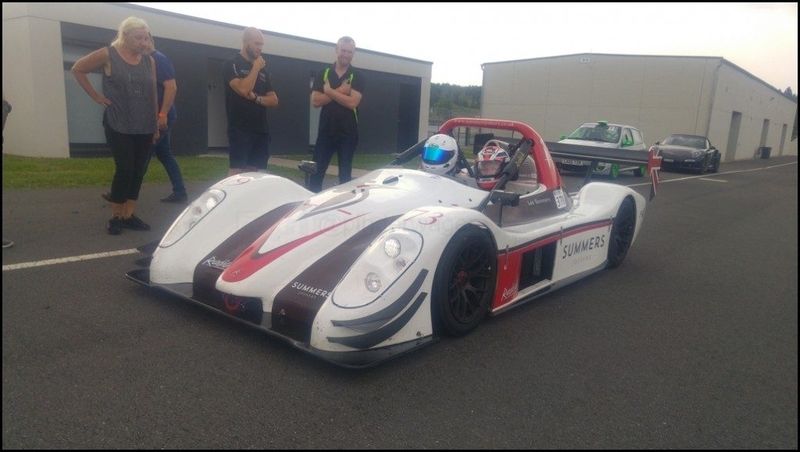 Darren didn`t have the racecar there but still found time to take the S8 out for a few laps just to experience the circuit. The chequered flag came out and we all went across to the restaurant for lunch. 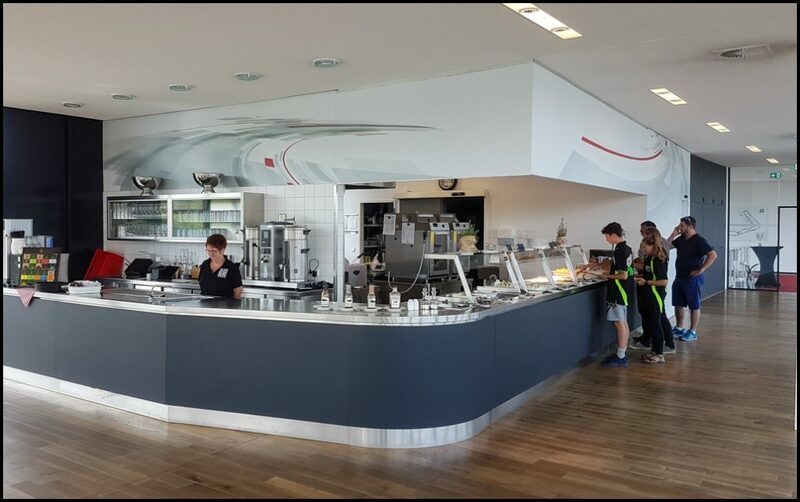 This is a little bit more upmarket than the cafe you usually see at a circuit ! Lunch was included and it was as much as you could eat from the self service counter. 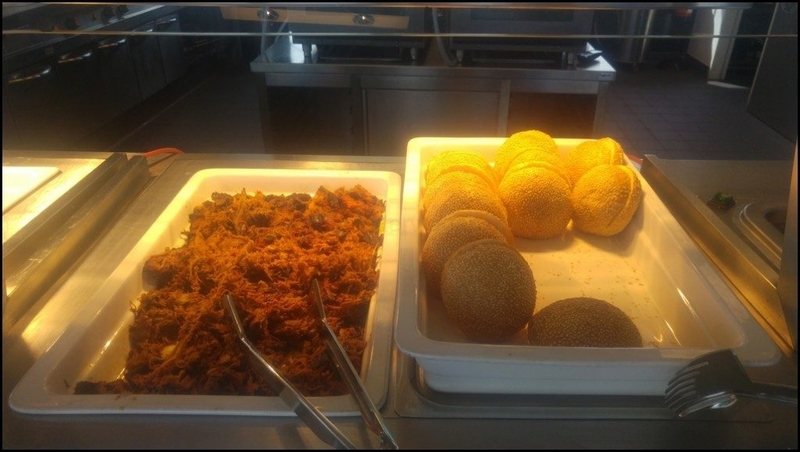 Pulled Pork sandwich ? Why not. 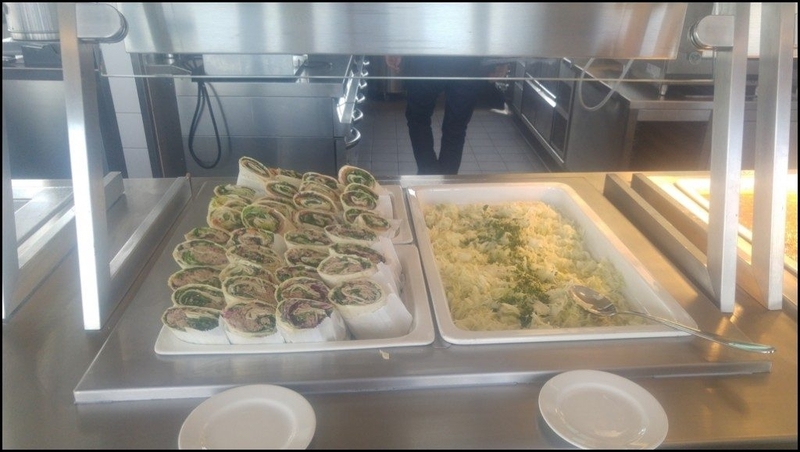 I`ll have a fresh salmon wrap with that too if you don't mind. 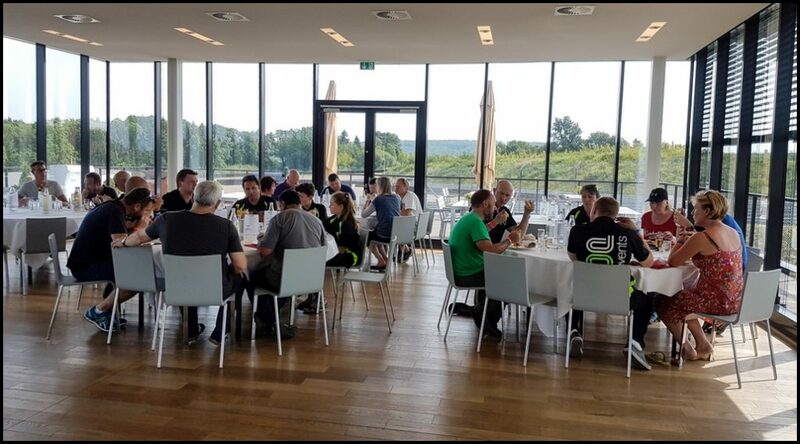 The restaurant was starting to fill up and all you could hear were snippets of conversations about what a superb venue and circuit this was. The overriding topic of discussion was how tricky it was to learn with the blind crests and how pretty much everyone was struggling in one place or another. 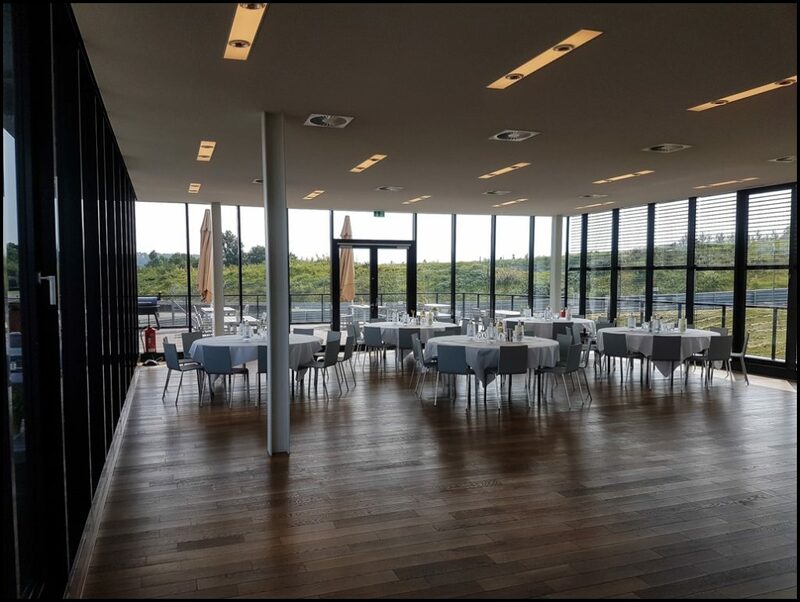 It would be quite easy to just sit on the balcony for an hour enjoying the scenery and atmosphere on a glorious summer`s day after eating more than I thought possible at lunch on a trackday, but it was so nice I had to go back for seconds. 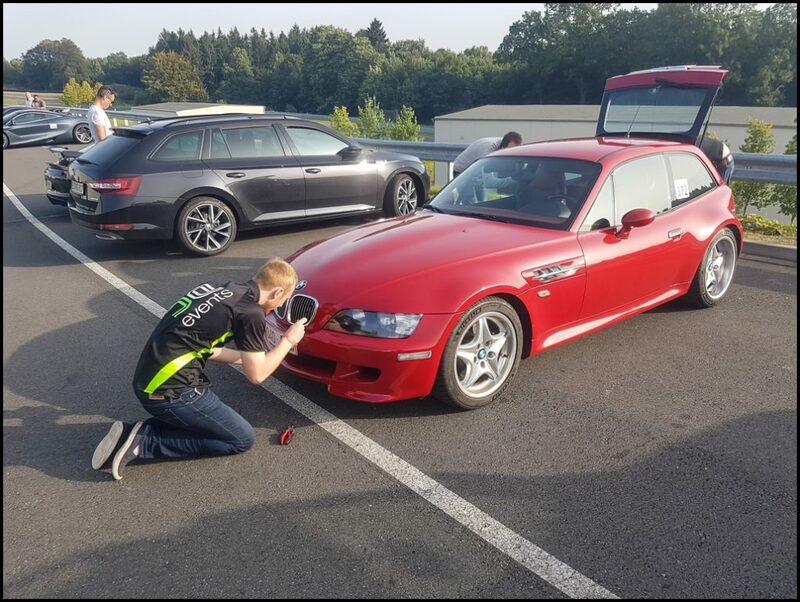 Instead Jochen explained that we had a rare opportunity to do some tracking shots on the circuit if anyone was interested. It wasn`t something that they were usually able to do. Was I interested? Try and stop me ! 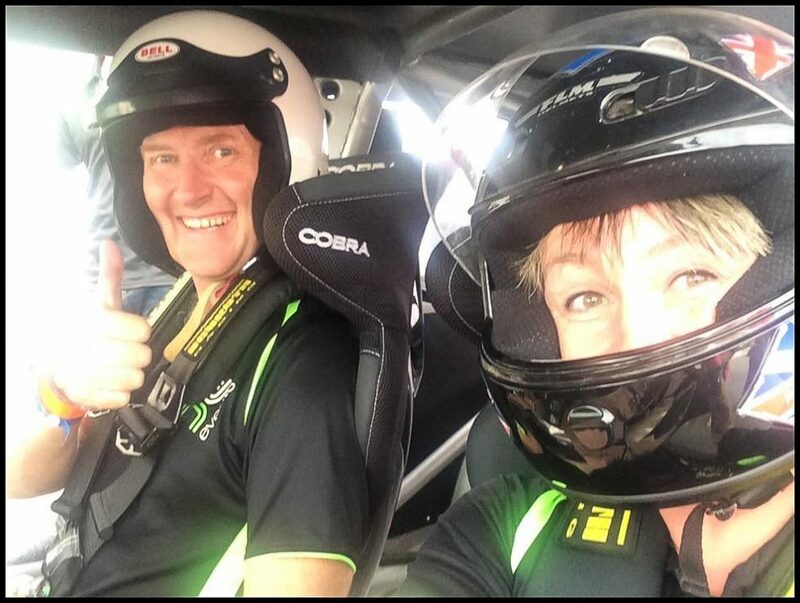 As it was to be low speed driving on a closed circuit, helmets weren`t required and Fern asked if she could go out with Steve. Toby was tasked with giving the wheels a quick wipe over. Jochen split those wanting photos into 2 groups. The supercars and the rest of us. We waited in the pitlane whilst they went out and took their photos. Jochen was laid in the back of the camera car as he directed each of us in turn. You needed to get really close to him until he was satisfied ! We all parked up at the top of the Mausfalle and Jochen called us down one by one. This gives you a really good idea of just how steep it actually is. Back into the Paddock and the satisfied look on Jochen`s face told us the photos would be worth waiting for. Moritz was free and I took him out for 3 laps. You may watch the feedback he is giving on the cooldown lap and think he it a bit harsh but he wasn't. Before we went out I explained I`m very self critical of my driving and I didn`t want him to just say "that is OK" or "that is bad", I wanted critique where necessary and he did not have to sugarcoat it. If I could improve, he needed to tell me how and why. He appeared to quite enjoy the laps and in particular my use of the kerbs. In the debrief after it was obvious he had picked up on everything I was doing. From short shifting, trail braking to get weight onto the nose into some corners to wheelspin when running a kerb, he remembered it all. Overall I was delighted with the feedback and his views on my driving. He suggested a few different lines but overall I was pretty much where I wanted to be. Farook listened in and picked up a few tips. He'd never been to BilsterBerg either but decided he would jump in with me for a session. We went out and just as I was leaving the pits I saw Farook in his GT3 behind me. 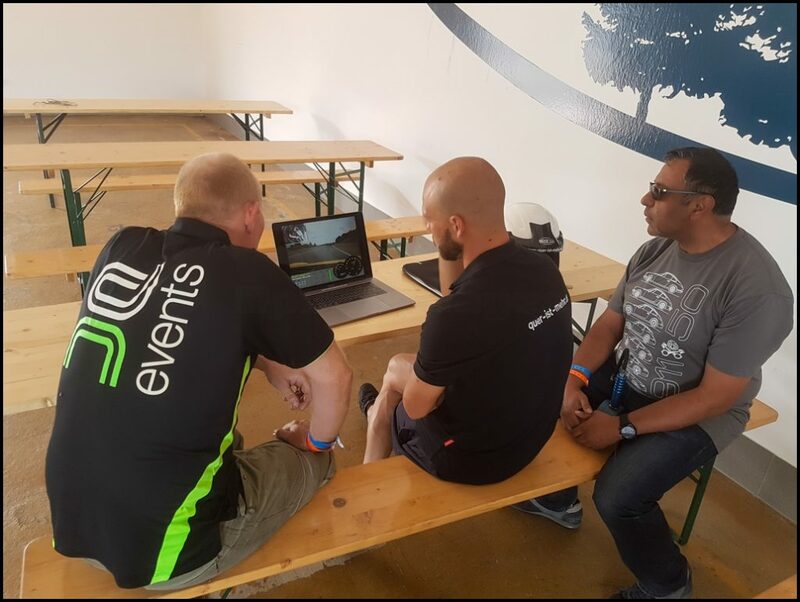 I`ve met him at loads of DN events and when we had been speaking before lunch he was saying he was finding it difficult to get a few sections right and was taking Moritz out for some pointers. Rather than slow down then be stuck behind him I stayed ahead and was up to speed within a couple of corners. He was still behind me near the end of the lap so I let him past and tagged onto him. 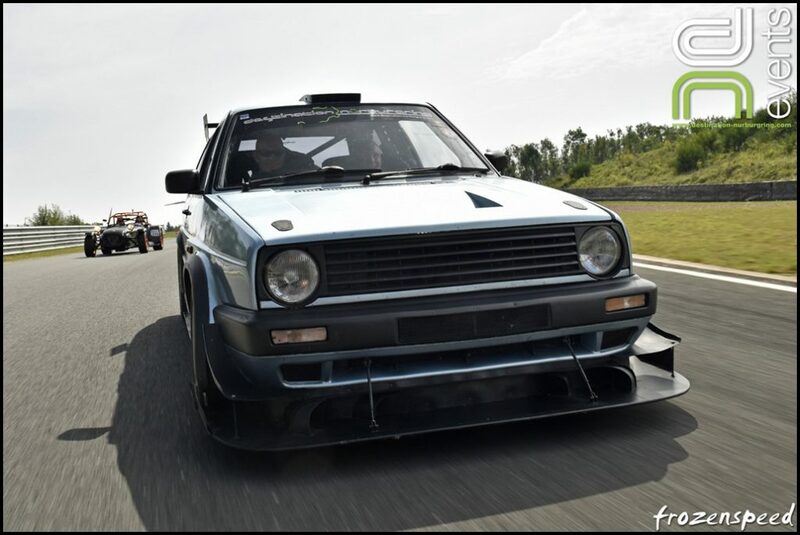 I hardly ever overdrive when I`m on track. It is very rare that I do but Farook was just that bit too quick for me. I started pushing harder and ended up being far scruffier than usual. I gave myself a mental telling off and backed off a fraction. 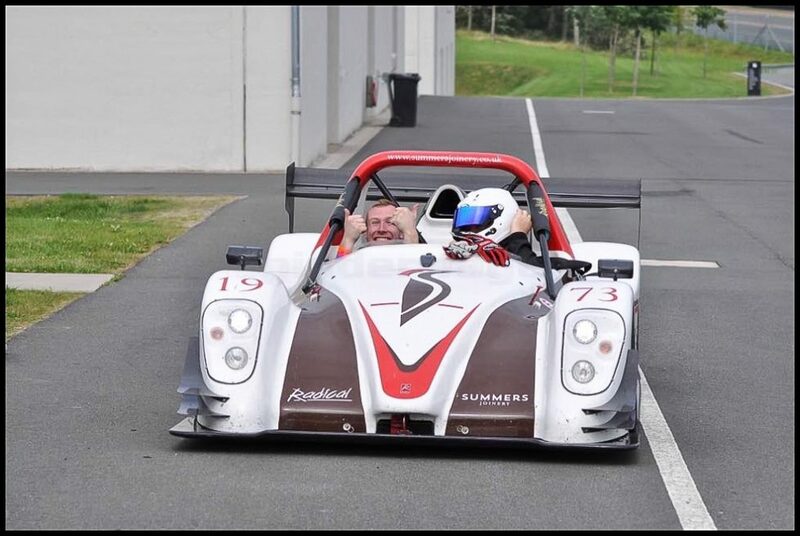 This was Karl`s first ever laps with me and I didn't want him getting out thinking I drove like that everytime. We did several more laps and then came back into the carpark. Karl commented on me overdriving and said he was surprised as that wasn't the reputation I had. I apologised and said I expected to be able to keep up with Farook as I was usually quicker than him. Lou had brought a couple of benches outside and they became a focal point for the day. Everyone grabbed a drink and sat in the shade whilst either discussing the previous laps or cooling down. I'd warned him it was hot in the cabin, but he wasn't prepared for just how hot it was..
"Why ?, what did he do ?" Everyone started laughing at me, which I thought was a bit harsh. I asked what they were laughing at and Lou told me to go and tell Farook what I'd just said. He was inside getting a debrief from Moritz, so they both turned to me as I congratulated Farook on getting up to speed so well considering how much he had been struggling. Then they both started laughing. 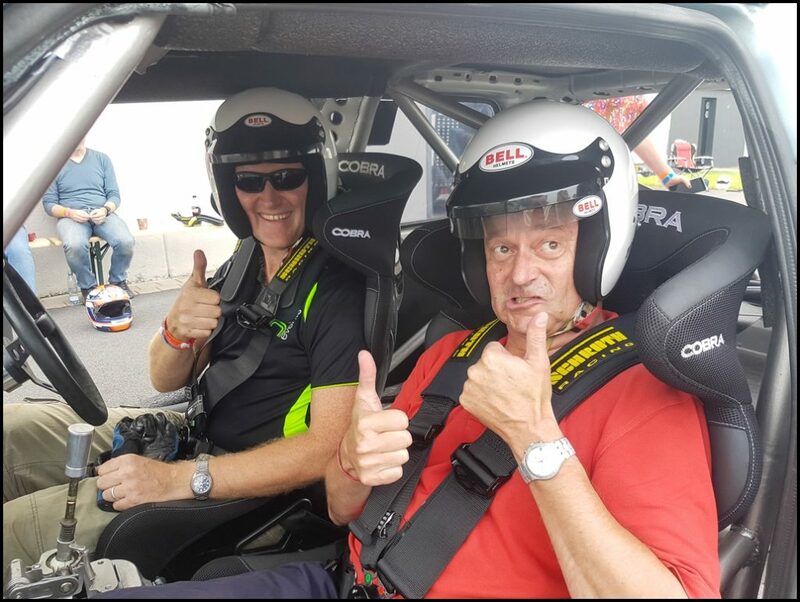 "Nige, it wasn't me driving the GT3, it was Moritz, I was a passenger.... "
If you have ever read one of my Nürburgring trip reports you will most likely have seen mention of the 'Comfy Corner' in Adenau. It is owned and run by Jörg and his wife Jagoda. 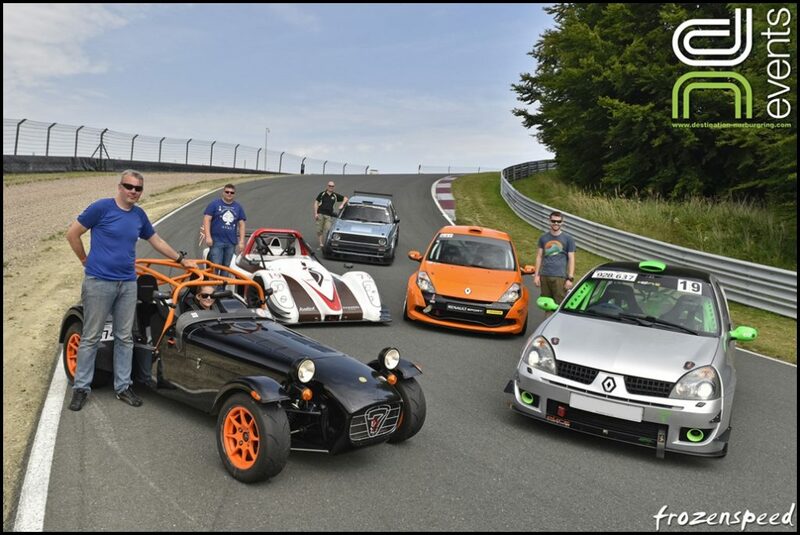 Jörg had driven up that morning just to spend the day with us all and to have some laps around the track. We had a brilliant session after lunch and he was as impressed with the track as everyone else. 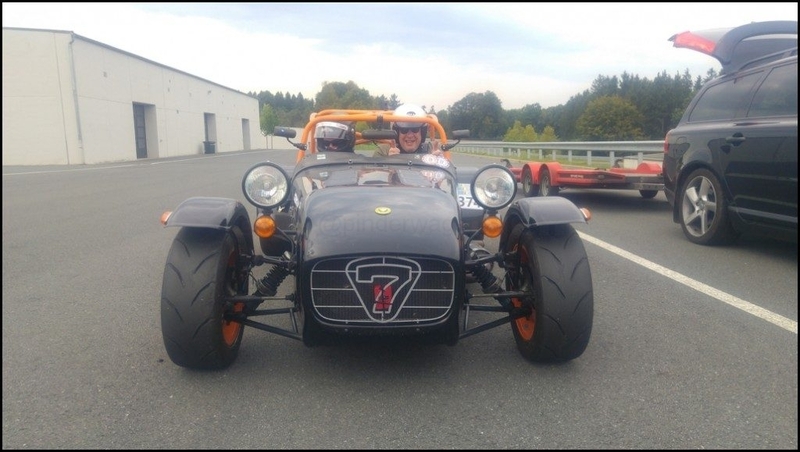 After going out with me he asked Steve if he would take him out in the Caterham. Steve wasn't sure Jörg would fit but said if he could get in the seat, he would take him out. 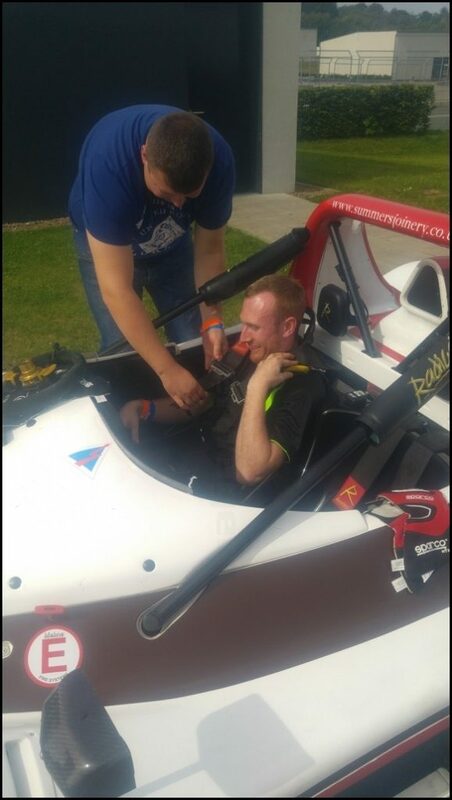 One shoehorn later, Jörg was strapped in. 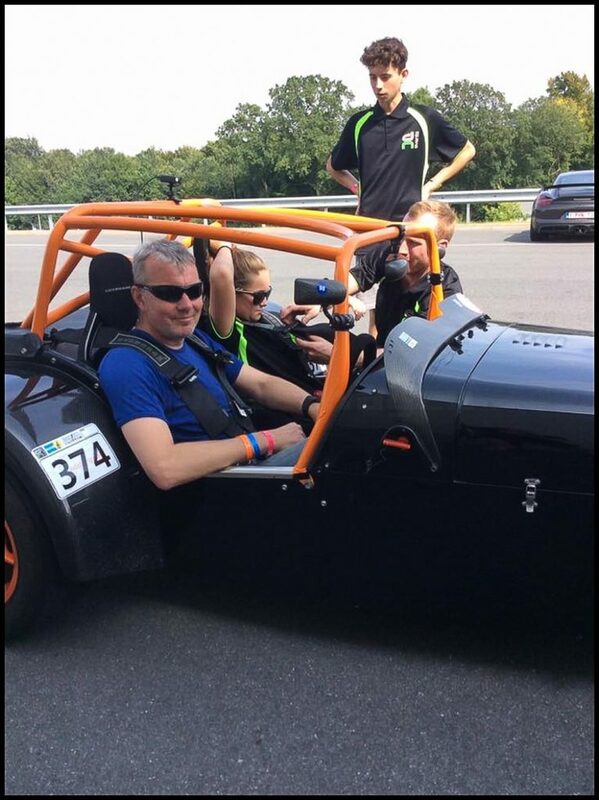 He was so excited after the laps, he kept telling us what great fun it was and how the car was perfectly suited to the track. 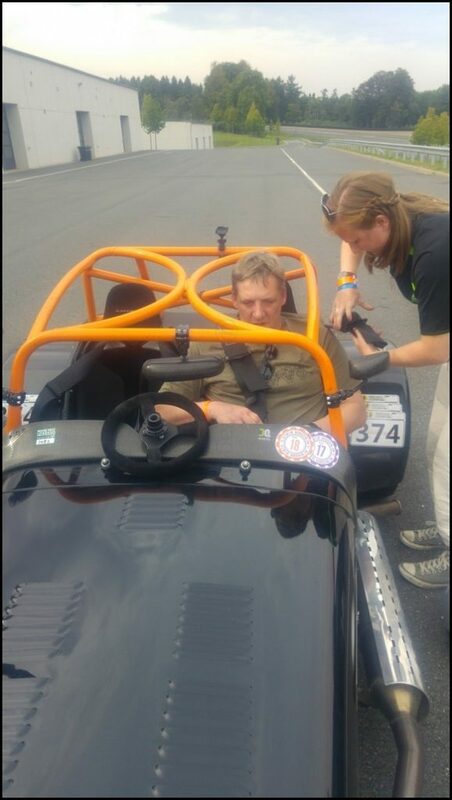 Lee asked Cat if she fancied going out in the Radical, she was sat down and getting strapped in within seconds. After half a dozen laps they came back in and she was almost as excited as Matt had been and he'd driven it ! Matt drove for a few laps near the end of the day and whilst he was grinning for pretty much the entire session, he felt the front right wasn`t gripping as well as he expected and was understeering more than when I had been driving. When we inspected the tyre afterwards it was worn well past the minimum wear bars and almost down to the canvas. Then the chequered flag came out and it was time to pack up. I was talking to Lee afterwards and discussing tyres. 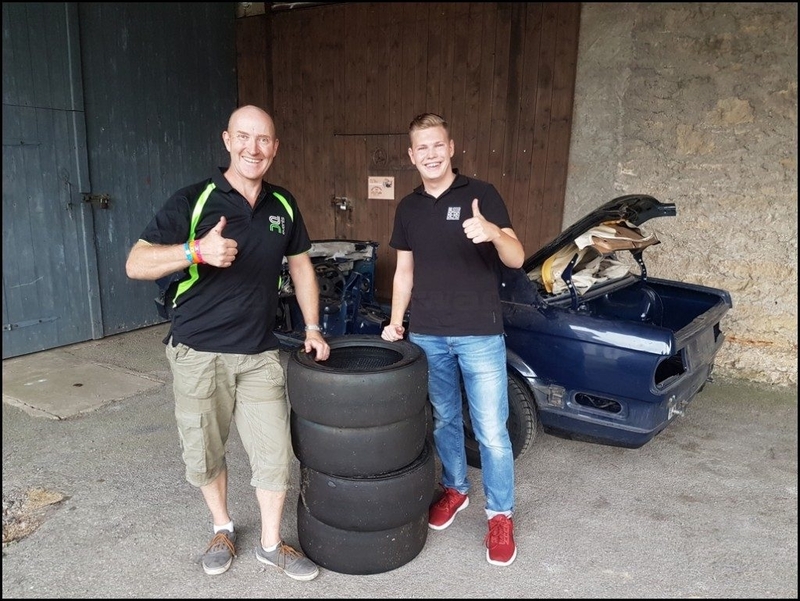 The Radical fronts are 205/50R15 Dunlops, just the same size as I run on the Golf.. Phillip, the circuit liason guy overheard this and asked if I was looking for more tyres. I explained I was alwayson the lookout for tyres if the price was right and they were in good condition..! We called into his unit on the way back to the guesthouse where he gave me 4 Hankook Slicks he didn't want anymore !. 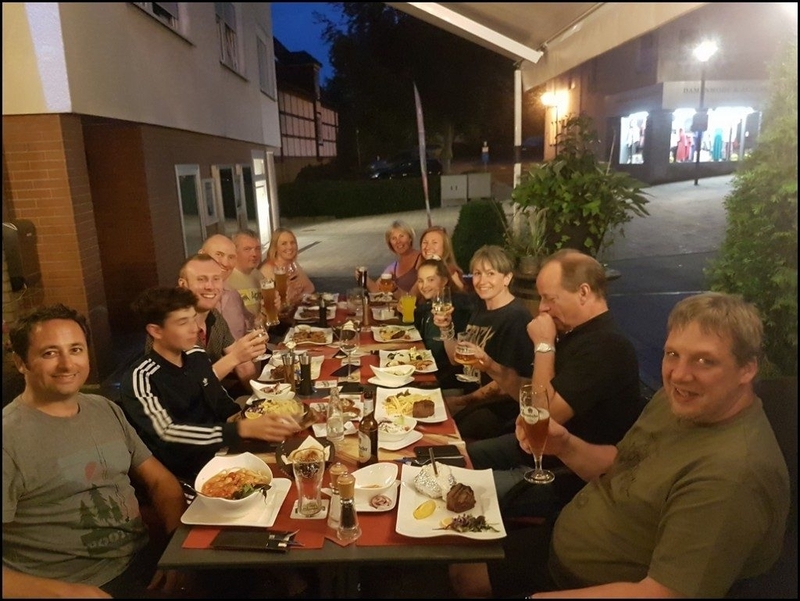 After a refreshing shower to freshen up we all went out for a meal at a lovely restaurant Darren had found when he was scouting the area earlier in the year. It was still lovely and warm and the ideal end to a truly spectacular trackday. Looking back on the day and I was finding it difficult to understand why I enjoyed it so much. 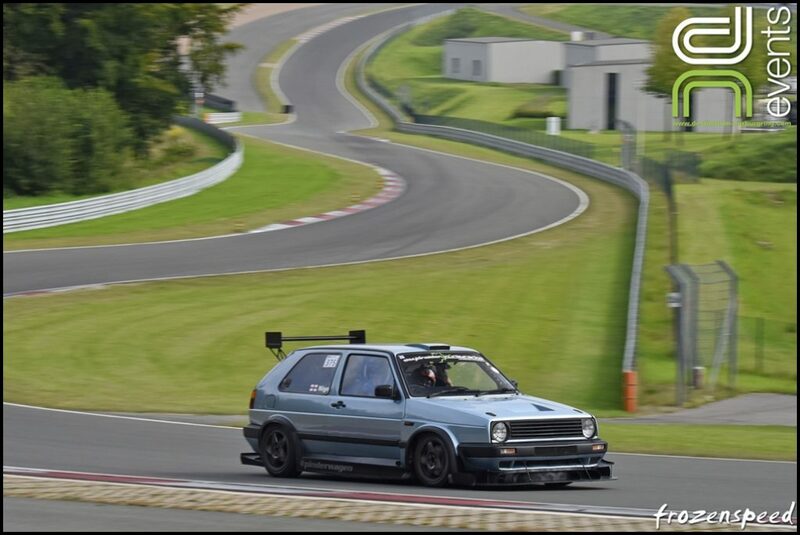 It was one of the best trackdays I have had this year but I couldn't put my finger on just why. 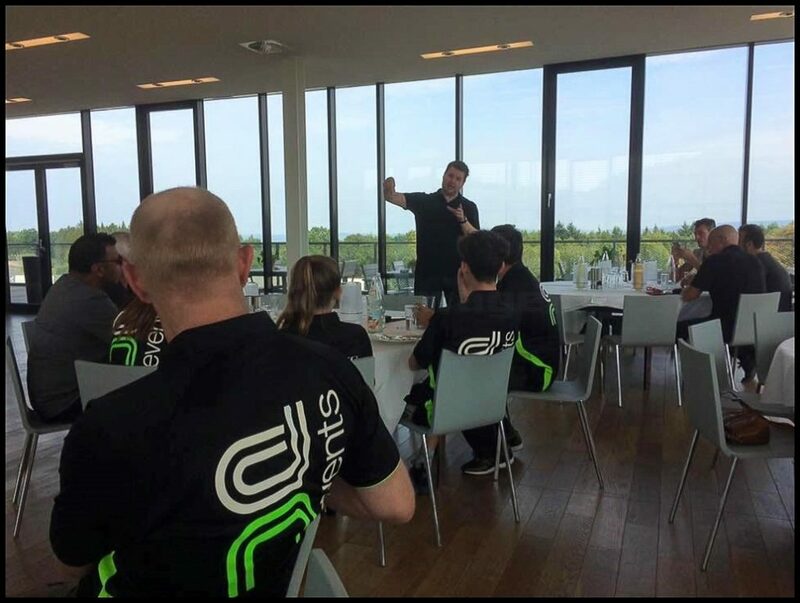 Sure, the venue was incredible and the circuit was great fun but that wasn't the reason. Then I realised what it was. 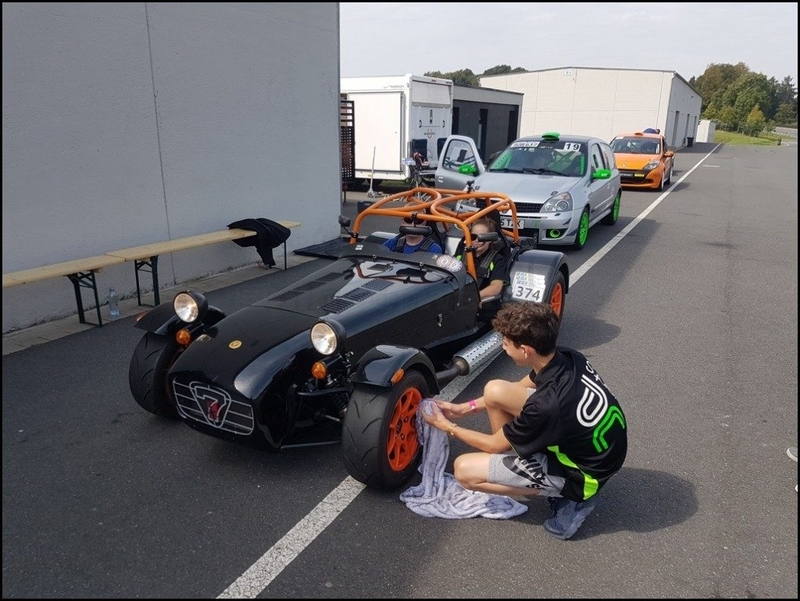 It is very rare that I go to a new circuit now and even when I do, I get a good idea of what I am doing after a couple of sessions. 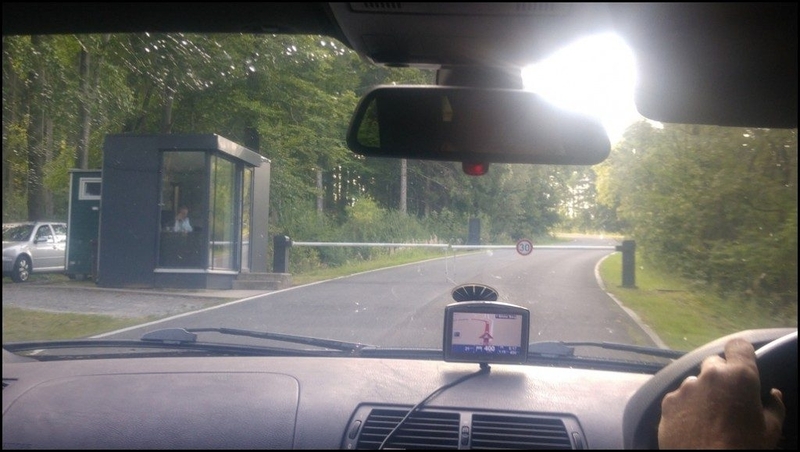 BilsterBerg was much harder to learn and that was what I had enjoyed. It was the challenge of having to learn a circuit with so many blind corners that I hadn't experienced since my first laps of the Ring. Whenever I'm lucky enough to take someone out for their first ever lap of the Ring, they are always blown away by the circuit. 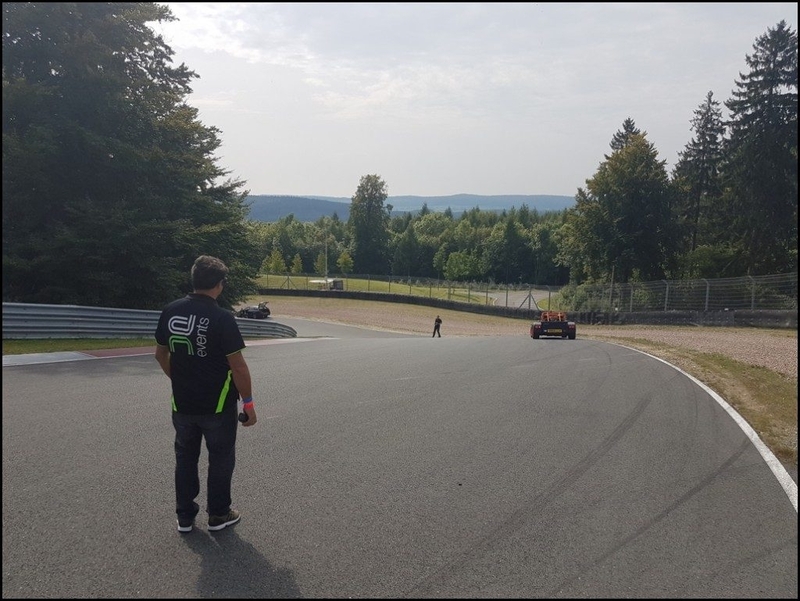 That was what I was feeling after BilsterBerg and I hadn't felt this since 2005.Steve felt the same, the challenge was not just driving the track but remembering where it went in the first place. 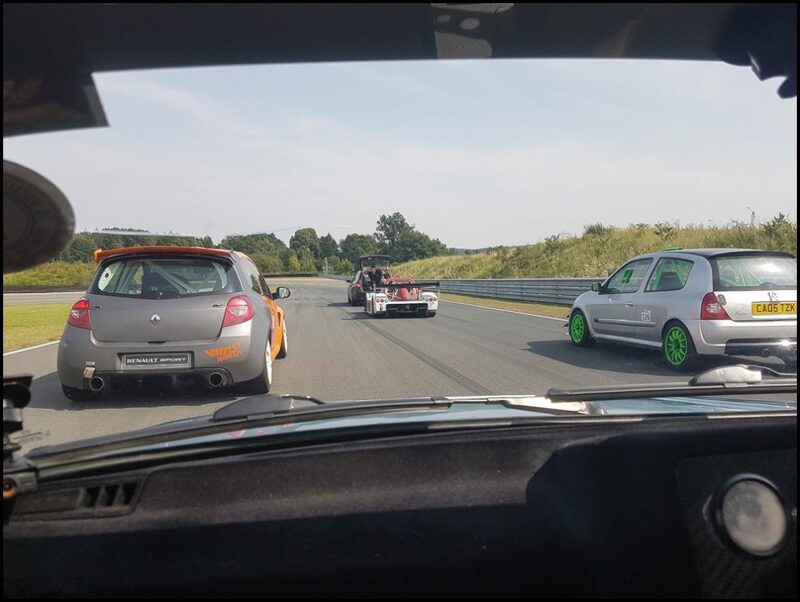 If you are lucky enough to be able to attend a trackday here I highly recommend you don't try and learn it beforehand. Wait until the day and experience that thrill of trying to remember where a difficult track goes. Most UK circuits have much better line-of-sight and it is easier to see where you are going and that helps you can learn it pretty quickly but this took longer and I loved that. 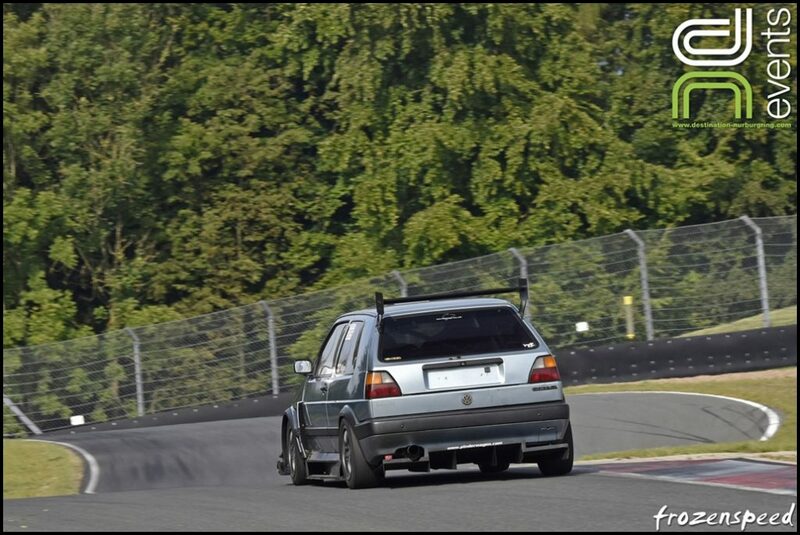 Having 2 days at the Ring and the next day here does mean if you have an issue you don`t have time to fix it. 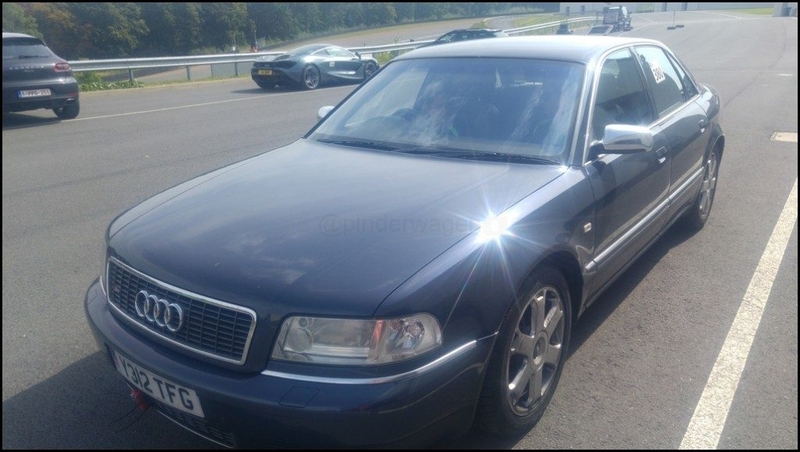 I was fortunate that the Golf behaved itself and I didn`t have a single issue at BilsterBerg. 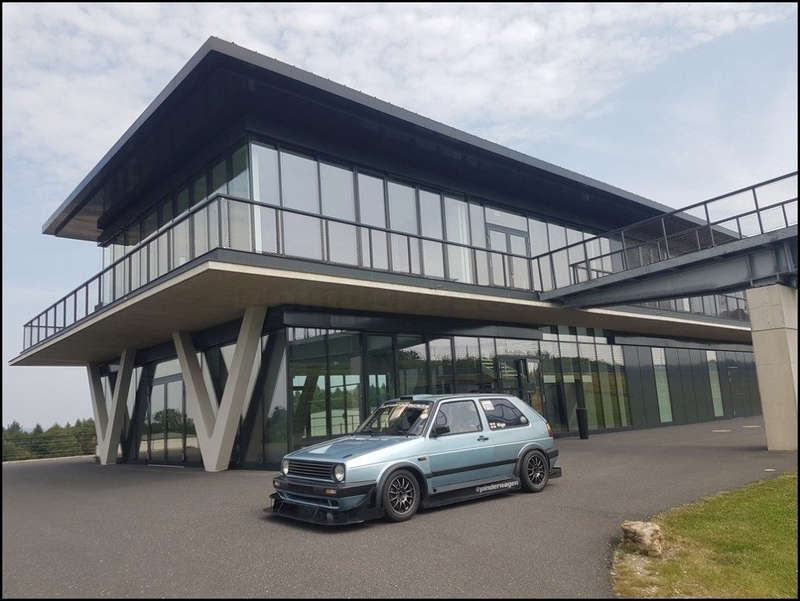 It also meant you had to drive up straight after the trackday which meant the Ring event just finished without the usual night of reflection with everyone else. 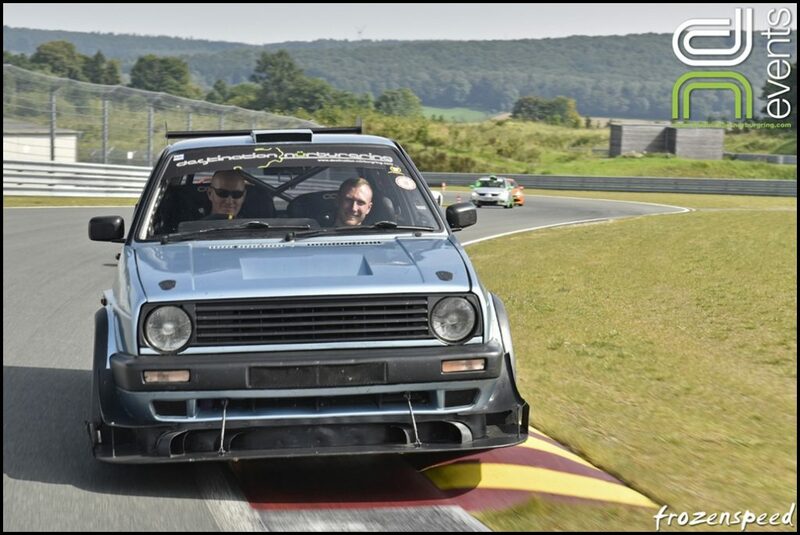 Whilst it would need an extra day away which I appreciate doesn`t work for everyone, I would personally prefer a day between the events, either 1 day at the Ring, a day off then BilsterBerg or ideally 2 days at the Ring, a day off and then BilsterBerg. If at all possible I will be attending this event next year and even though I already know where it goes, it is a challenging enough track that one visit most certainly isn`t enough. 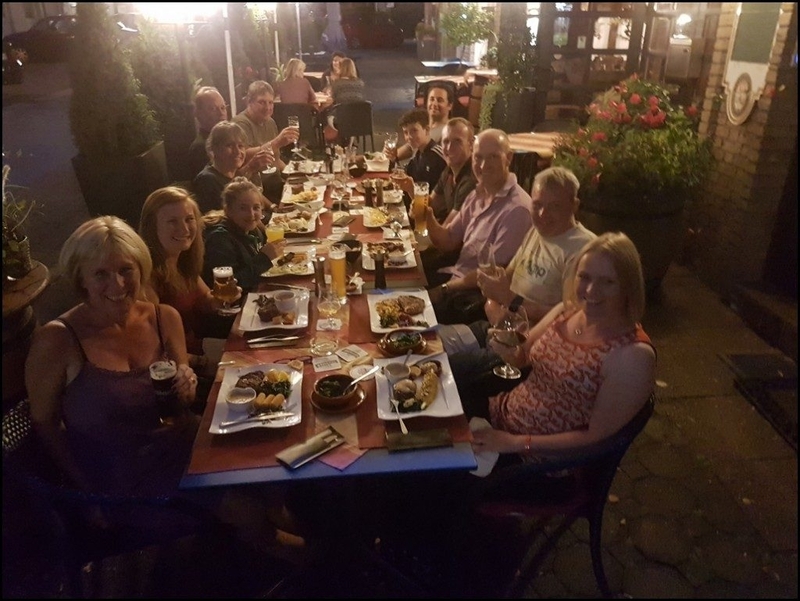 Another fantastic write up and pics of a great trip. Brilliant report. Far cry from the clubgti day I did at Knockhill a few years back in the silver Corrado.